One of my frustrations in life is that I can spot a typo in someone else’s work from a mile away, but I simply cannot see my own mistakes. Seriously, a printed page on the other side of a desk facing upside down to me is a cake walk to catch mistakes, but in what I can only assume is a built-in delusion about my own writing talents, I simply cannot see where I’ve botched something up. I run spell checkers, I have Steve read my blog posts before they go up, sometimes I trick Steven Goetz into reading things for me, and I have early warning systems in place like Roger Nash from England who gets up before anyone else and tells me about my errors. But still, these errors leak through. When we’re lucky, I’ll be reading a post for the podcast and I see a mistake and stop and fix it. But those blog posts have been up for days with those mistakes. It drives me nuts. I may have found the solution to my problem. 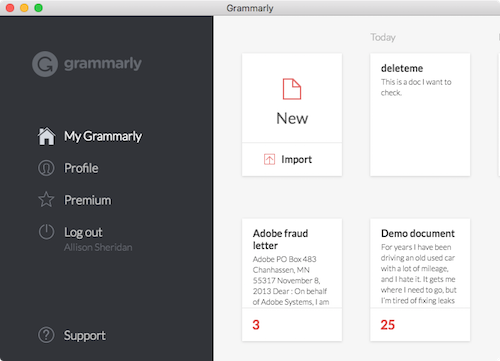 It’s a web service called Grammarly from Free Grammar Checker | Grammarly. This product has a bunch of facets, so I’ll start with how I use it and then expand into what else it can do. Grammarly can be installed as a browser plugin. You can simply go to the extensions or plugins or add-ons directory for your favorite browser, or you can go to support.grammarly.com/… to find direct links to the one you want. Once Grammarly is installed in your browser, you simply navigate to any website where you’d like to add content and start typing. It can be making a comment on a blog, writing a bug report to a developer, or writing social media posts on sites like Twitter, Google Plus or Facebook, almost anywhere on the web that has text fields. I say “almost” because you can’t use Grammarly in Google Drive. They do say that they hope to have it soon, and they do have a workaround, but we’ll get to that in a bit. After installing the Grammarly plugin to your browser, when you start typing into a text box on the web, at the bottom right of the text box you’ll see a green spinny thing as you type, which may stay green. But if you’re like me it will turn into a red circle with a white number inside it showing how many corrections it thinks you need. In addition, each presumed error will be underlined in red. So far it sounds like any operating system’s built-in spell checker. But with Grammarly you don’t have to click on anything, just hover over any of the red lines and Grammarly will tell you what she thinks you did wrong. Misspelled words are pretty obvious. You can click on the correct spelling to fix the mistake. You can also choose ignore if you think (or know) she’s wrong. But you might have an odd word that you want to add to the dictionary. 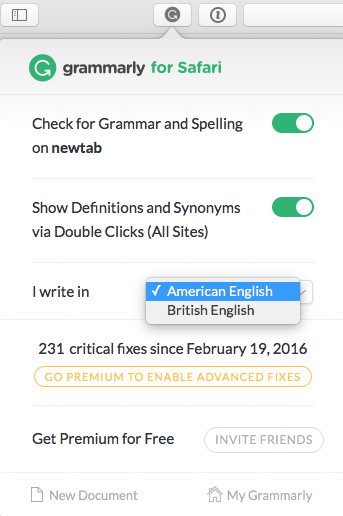 If you choose that option, you’ll be prompted to create a login to Grammarly. The account login is free and in addition to giving you a stored dictionary, you can enable or disable Grammarly on preferred websites, and they’ll send you weekly writing statistics and tips. They haven’t been spammy with the tips in my experience. I find Grammarly much quicker to fix my typos simply because I don’t have to click on the mistakes, only on the fixes for the mistakes. It’s rather pleasing in that way. She finds LOTS of places where I’m missing commas and even more places where I put them and I shouldn’t have. The weird thing is that most of the time, in reading her correction, I can absolutely tell that her way is the right way. It’s not that I don’t know the rules, it’s just that I get sloppy I guess. The funny thing is she found a missing typo in my intro sentence that’s on every single NosillaCast blog post! Now I don’t want her to get a swelled head, she is completely wrong from time to time, but I’d say the game is running about 20 to 1 in her favor. Another thing she finds for me is where I’m missing hyphens. Just this week I wrote “lickety split” and forgot the hyphen. Apple’s spell check simply thought the word should have been rickety or lackey. I write my posts in a great blogging tool called Mars Edit, from red-sweater.com and then push them up to my blog. I write in the HTML text editor so my text is full of HTML code. That usually causes spell checkers to lose their ever-loving minds, but not Grammarly. For the most part, she simply ignores it which is exactly what I want. Pretty cool algorithm that she can tell the difference between code and regular text. Clicking on the browser plugin icon in your toolbar of your browser reveals an option to change from American English to British English but no other languages I’m afraid. If you’re looking at your writing and. you’re not happy with a word, you can double-click on it and get a synonym. While you’re there, it will even define the word for you, which can be super handy if you’re not sure you used the correct word. There’s one more very cool thing about having a Grammarly login, and it’s the answer to not being able to have Grammarly check your Google Docs. If you navigate to app.Grammarly.com/…, you can create documents right within the browser like you would with Google Docs. You don’t need to remember or bookmark that URL, just click on the browser extension button for Grammarly in your toolbar and you can go right to My Grammarly to see all of your documents, or go right to New Document and get to typing. You can even upload a document right into My Grammarly. I tested it with a .doc and .rtf file and they both worked, but a PDF did not, which makes sense. In the web interface when you upload a document, it even preserves the formatting so you can export when you’re done and not lose all of your work. I haven’t exhaustively tested that so if you’re a big formatter you’ll want to check that for yourself. In the web interface, you can see your personal dictionary where you’ve saved words. Right there you can delete words from the dictionary or add new words manually. The Premium model is $30/month if you pay month to month, with price breaks for longer commitments. The least expensive plan is an annual plan that ends up being $11.66 per month. For a non-professional blogger, that’s fairly steep but for someone who makes their living writing, that’s really not that bad. Ok, now you’re with me that they have a business plan, right? As I’ve looked into Grammarly more deeply, I keep finding new, cool things. I was poking around on My Grammarly and I found a tab that talked about apps. When in Safari it showed the Safari extension for Grammarly, and when in Firefox it showed the Firefox extension. But in both, it showed Grammarly for OSX. I forgave them for not knowing it’s called macOS and downloaded the app. By the way, I was too lazy to scrape the dust off my PC and boot it up to find out whether there’s a Windows desktop app for Grammarly but I would presume there is! Grammarly for the desktop opens with a little 5-page guide. It explains that all Grammarly documents are stored in the cloud so there’s no syncing or saving to worry your pretty little head about. Unless you don’t want to store it in the cloud of course. With Grammarly on the desktop, you can drag documents right into the interface ( copy and paste works as well). The standalone macOS app works beautifully. It’s pretty much indistinguishable from the web interface at My Grammarly so you won’t have any trouble getting the hang of using it. Beautifully might be in the eye of the beholder, because neither the web or desktop versions are accessible to screen readers. 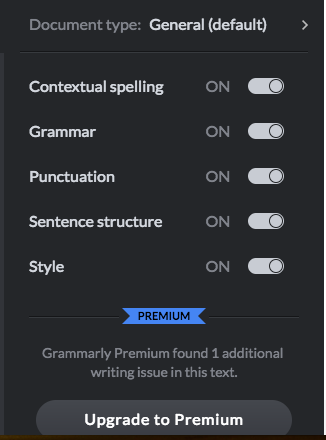 In Grammarly on the web or in the app, you can turn on and off checks for contextual spelling, grammar, punctuation, sentence structure, and style. Maybe you think you know everything about punctuation and you’d rather not have her nagging you, then flip off that switch and she’ll still tell you how bad your grammar is! Steve and I have both been using Grammarly for a couple of weeks, and I’ve noticed a marked decrease in typos when I go to read posts for the podcast. Premium isn’t a big draw for me, but they do have a thing where if I refer someone to Grammarly Premium, I get a free month and so do you. If you’d like to test Premium and want to have me enter your email, just drop me a line at allison@podfeet.com and I’ll hook you up. I promise my feelings won’t be hurt if no one wants to give it a spin! Go check out Grammarly at grammarly.com. It’s fixed 231 critical problems for me so far! Can you explain how MarsEdit can be made to allow Grammarly to check your grammar while you edit? MarsEdit does not allow a plug-in for this, and MarsEdit is not using a web browser to display your writing as a preview. Sorry if I mislead you Andrew, MarsEdit doesn’t let me use Grammarly. I. write in MarsEdit, push to my server, then run Grammarly inside WordPress. Daniel the MarsEdit dev is really great, I wonder if he could integrate it?